PowerCore 20100 USB-C. Apple and Android smartphones, tablets (including Nexus 7). Ultra-High Capacity. -Use the included cable, your original cable or a third-party-certified one (such as MFi). The new MacBook 2015/2016 (with included USB-C cable). Anker’s own 11-point safety suite, MultiProtect, protects against all charging-related hazards. Perfectly Portable. Incredibly Compact: The size of a small candy bar (9.7 x 4.3 x 2.3 cm) it fits perfectly in your pocket. 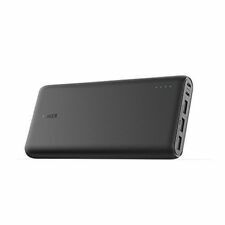 Anker PowerCore II Slim 1000 UN Black. PowerCore II 10000. 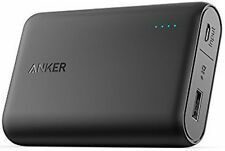 Anker Power Bank PowerCore 10000. Certified Safe: Anker's MultiProtect safety system ensures complete protection for you and your devices. PowerCore 10000. PowerCore 10000 is incredibly small and light for its large capacity. 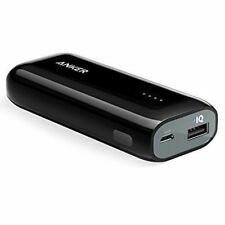 Anker PowerCore Portable Charger 10400mAh - Black. Condition is Used and work perfectly. PRICE PER UNIT. Battery will be sent fully CHARGED and will be tested before shipping ( charger is not included) . Dispatched with Royal Mail 1st Class. Worry-Free At Anker, we believe in our products. That's why we back them all with an 18-month and provide friendly, easy-to-reach support. With a Type-A-to-Type-C cable, only regular charging speed is possible for Nexus 5X and 6P. 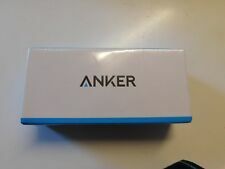 Anker PowerCore 20100. At Anker, we believe in our products. That's why we back them all with an 18-month warranty and provide friendly, easy-to-reach support. Ultra-High Capacity. Enormous 4.8A Output. PowerCore 5000. Once the order has been marked as dispatched, we will not be able to cancel the order. What's in the Box. • 1 travel pouch. 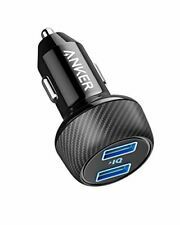 Anker PowerCore 20100. PORTABLE SPEAKERS. Fast-charging, long-lasting, portable power. Ultra-High Capacity. Enormous 4.8A Output. MultiProtect Safety System. Surge protection, short circuit protection and more advanced safety features keep you and your devices safe. Part of Anker’s renowned wireless charging range, designed especially for your Samsung device. Output: 5W / 10W. Compatible iPhone XR/Xs Max/XS/X, Fast-Charging Samsung Galaxy S10/S10 /S10e/S9/S9 and More, PowerWave Stand (No AC Adapter). Part of Anker’s renowned wireless charging range, designed especially for your Samsung device. Compatible iPhone XS Max/XR/XS/X/8 Plus, 10W Fast-Charging Samsung Galaxy S10/S9/S9 /S8 , 5W for New AirPods and More (No AC Adapter). 6ft (RED) Nylon Braided Tangle-Free Micro USB Cable. 6ft Nylon Braided Micro USB Cable. Long&Slim: 6ft nylon cord 2X longer than your original. Compact connector head fits most cases. With an extra long 6ft cord, connect your phone, tablet or other devices further than before. Just set your phone down on the pad (leaving your case on), then get up and go as quickly as possible with Anker's world-renowned technology. At Anker, we believe in our products. That's why we back them all with an 18-month warranty and provide friendly, easy-to-reach support. Cutting-edge wireless inductive technology simplifies charging into just setting your phone down on the charging pad. Sleek, compact build takes up minimal space. Premium Design: LED indicators, non-slip pad, and compact build ensure simple and convenient charging. Incredibly Compact: The size of a small candy bar (9.7 x 4.3 x 2.3 cm) it fits perfectly in your pocket. PowerPort Wireless 5 Stand. Certified Safe: Totally eliminate the radiation and overheating risks associated with wireless charging. Output: 5W / 10W. your devices. Place horizontally to enjoy videos while charging, or go vertical for video conferencing or to use facial recognition technology. Super-High Capacity. High Capacity. MultiProtect Safety System. Surge protection, short circuit protection and more advanced safety features keep you and your devices safe. PowerPort Wireless 5 Pad. 3ft Micro USB cable (AC adapter not included). PowerCore 5000 utilizes two different fast-charging technologies. High Capacity: Contains 5000 mAh of power. So small that it'll sit almost unnoticed in any pocket or bag. Ultra-Compact: Remarkably small, tubular design slides easily next to your phone in any pocket or bag. 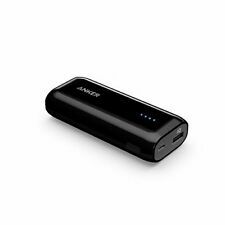 Anker PowerCore 10000Ah External Battery Power Bank iPhone Samsung and more..
Anker PowerCore 10000 Portable Power Bank Black. 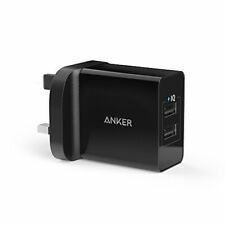 Anker PowerCore 10000. Certified Safe: Anker's MultiProtect safety system ensures complete protection for you and your devices. The item in Good condition. 6ft (BLACK) Nylon Braided Tangle-Free Micro USB Cable. 6ft Nylon Braided Micro USB Cable. Long&Slim: 6ft nylon cord 2X longer than your original. Compact connector head fits most cases. With an extra long 6ft cord, connect your phone, tablet or other devices further than before. Superior Safety Anker's MultiProtect technology combines surge protection, short circuit prevention and other advanced safety features to keep you and your devices safe. Use PowerPort 4 Lite with: iPhone 6, iPhone 6s, iPhone 6 Plus, iPhone 6s Plus, iPhone SE, iPhone 7, iPhone 7 Plus, iPad Air 2, iPad Pro Samsung Galaxy S6, Samsung Galaxy S6 edge, Samsung Galaxy 7, Samsung Galaxy 7 edge, Samsung Galaxy S8, Samsung Galaxy S8 . and much more. Anker PowerCore 20100 USB-C. 60cm USB to USB-C cable. 60cm Micro USB cable. USB-C Compatible: Fully compatible with the new MacBook (not MacBook Pro), charging at 5V/3A. USB-C port acts as input and output. 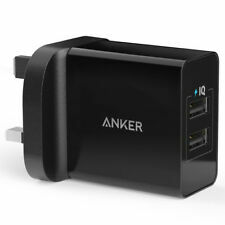 Anker PowerPort 5. 40W 5-port USB charging hub for phones, tablets & more. If a port isn't working properly, it may be because your device has triggered the protective internal safety switch. In order to reset the switch, unplug all cables (including power cable) for five seconds and retry. Anker were established in 2009 and have grown from strength to strength since their conception. The company is now an industry leader in providing mobile power. The brand creates many products including Anker chargers and docks for mobile phones and PDAs. The philosophy of Anker is to ensure that you have the power and the freedom to enjoy life's adventures, which is why their range of sophisticated chargers can guarantee that your phone can be with you wherever you go. Anker offer a broad range of charging products for every need and are designed to cover every situation. The PowerCore collection of portable battery packs means that you can charge your phone when you have no access to a plug socket or conventional power supply. PowerCore works by being charged up by its USB port, and it can then retain a wealth of energy so that you can charge your mobile phone and any other gadget. PowerCore is ideal for festivals, camping and travelling. The charger is perfect when you're out and about, and you need to give your phone a much-needed boost quickly. Car Chargers ensure fast charging when you are out on the road. These devices connect to your cigarette lighter in your vehicle and work quickly to deliver the fastest possible charge, ideal if you're on the go and need your phone ready quickly when you arrive at your destination. Some devices come with the capability of wireless charging, Anker offer a range called PowerTouch. These devices consist of a flat landing pad that will charge your phone, simply by setting your phone on the port. It requires no cables which can damage the ports on your phone and means that you can quickly grab your phone when you need it, with complete ease.